As already mentioned on my other blog I enjoyed some of it last weekend. My taste buds aren't well developed enough to give a detailed description of the taste, all I can say that it was very nice. I think I could detect a hint of the peaty Laphroaig, strong enough to taste it, but not overpowering the taste of the salmon. 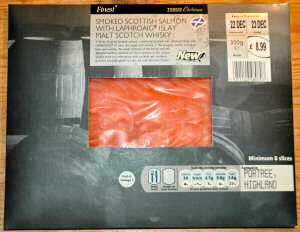 As you can see from the packaging the salmon was farmed on the Isle of Skye, although salmon can be caught on Islay as well. There's also a fish farm among the industries on the neighbouring Isle of Jura, growing salmon smolts. May be they supply the farm at Portree? Either way, I quite liked it and might eat it again for another occasion. I'm visiting my parents in Germany over Christmas, but may be for New Years Evening?